Monday, October 1st at Snow Park. 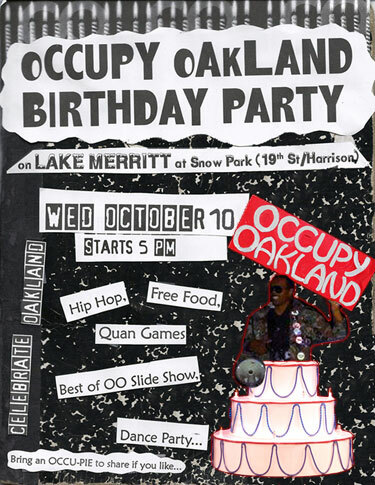 Come and help plan the one year anniversary of Occupy Oakland! What books would be good for Occupiers to know about? What books can help us “change the world”? If you’re aware of any, please attend, and share what you know. Or if you might possibly be curious to hear from others, please also attend! New schedule and additional location! Bi-Monthly meetings to organize and publish web content for occupyoakland.org. If interested on helping us out, please come and join us! NOTE: Folks attending Monday changed the venue from OGP, hence the dueling events announcements. The OO Labor Solidarity Committee meets weekly, with every other meeting being held at Oscar Grant Plaza weather permitting. This week’s meeting will take place in the amphitheater at Oscar Grant Plaza, just outside of City Hall. PLEASE CHECK BACK AS THERE IS STILL A CHANCE THE LOCATION MAY CHANGE!! The main topic for this meeting will be discussion of and preparation for an Oakland Port Workers’ rank-and-file Assembly scheduled for October 6th. Non-unionized airport workers (the Port of Oakland runs the Oakland Airport) have been targeted for union-organizing activity while UNITE HERE is trying to organize them. SEIU Port workers have no contract currently and ILWU contracts at various locales on the West Coast are due to expire soon. Couple that with deep labor unrest at various ports up and down the East Coast, and there seems to be a lot of possibility to work together and show solidarity. Other topics may include the aftermath of the Chicago Teachers’ strike, recent events in South Africa, United Food Workers Union troubles, massive protests in Portugal and Spain, the Castlewood settlement, and Alan Blueford Coalition organizing. We meet biweekly. After our BBQ, our speakout, and our events at City Hall in September, we will be planning further steps in our search for Justice For Alan Blueford. Come help us out! Please visit the Justice 4 Alan Blueford website. Please sign the petition demanding Justice For Alan. Hopefully we will have secured a sound system, projector and screen that we can set up get ready for Wednesday. See this post. Party, feast, slide show, games, toasts, music. We are awesome, let’s celebrate. The OO Labor Solidarity Committee meets weekly, with every other meeting being held at Oscar Grant Plaza weather permitting. This week’s meeting will take place at UNITE HERE, on the 2nd floor of 1440 Broadway. Topics will include a review of the Port Workers Assembly put on by this committee Saturday, a discussion of what we might do for November 2nd, the one year anniversary of the General Strike, possibly a report back from the ILWU Executive Board meeting with the Blueford family, along with ILWU, Castlewood, Airport workers, United Food Workers and other labor activity updates. On December 11th, civil rights attorney Jim Chanin will file a motion to put OPD under Federal receivership. How would Federal control affect the people of Oakland? Will a federally controlled police force be more interested in crime suppression or political repression? How much will the people pay? Presentation and Speakout with update on court case by Jim Chanin. NOTE THAT THIS IS NOT OUR NORMAL MEETING PLACE. WHILE IT IS AN SEIU HALL, IT IS A DIFFERENT SEIU HALL (on Oak St, not Myrtle St). We are now meeting weekly. After our BBQ, our speakout, and our events at City Hall which drew much attention to Alan’s cause in the media and hence the general public, and the DA’s pronoucement that Masso was justified in gunning Alan down, we will be planning further steps in our search for Justice 4 Alan Blueford. Come help us out! A couple of the things we are planning are to put further pressure on the District Attorney to charge Officer Masso with murder, and we are in the early stages of organizing a large march in November with an emphasis on opposition to Stop & Frisk, the policy which led directly to Alan’s death, and the repeal of the Police Officers’ Bill of Rights, a California law which protects Officer Masso from investigation unlike ordinary citizens. The OO Labor Solidarity Committee meets weekly, with every other meeting being held at Oscar Grant Plaza weather permitting. This week’s meeting is tentatively scheduled for the amphitheater at Oscar Grant Plaza, directly in front of City Hall. PLEASE CHECK BACK BECAUSE THIS LOCATION COULD VERY WELL CHANGE! Topics will include planning for the next Port Workers Assmebly, the Mi Pueblo action this Saturday, a discussion of what we might do for November 2nd, the one year anniversary of the General Strike, along with possibly ILWU, SEIU, Castlewood, Airport workers, United Food Workers, Walmart and other labor activity updates. Planning for a BBQ at the Peoples’ Library at 1449 Miller Ave. at East 15th in Oakland at 5 PM, Friday October 19th. The BBQ will be held on October 27th. We are now meeting weekly. After the release of the (redacted) police report, the (whitewashed) DA’s report and its pronouncement that Masso was justified in gunning Alan down, and our press conference denouncing same, we will be planning further steps in our search for Justice 4 Alan Blueford. Come help us out! We are in the early stages of organizing a large march for November 10th, 2012 with an emphasis on opposition to Racial Profiling, particularly Oakland’s de facto Stop & Frisk policy — which led directly to Alan’s death — and the repeal of the Police Officers’ Bill of Rights, a California law which protects Officer Masso from investigation unlike ordinary citizens. Justice 4 Alan Blueford Coalition website. Planning Meeting for #O25 @ 19th & Telegraph Ave.
Let’s plan for the anniversary of police destruction of the first camp. Bring warm clothes, maybe an umbrella.